We develop methods for accelerating metric similarity search that are effective on modern hardware. Our algorithms factor into easily parallelizable components, making them simple to deploy and efficient on multicore CPUs and GPUs. Despite the simple structure of our algorithms, their search performance is provably sublinear in the size of the database, with a factor dependent only on its intrinsic dimensionality. We demonstrate that our methods provide substantial speedups on a range of datasets and hardware platforms. In particular, we present results on a 48-core server machine, on graphics hardware, and on a multicore desktop. Seldin, Y., Cesa-Bianchi, N., Auer, P., Laviolette, F., Shawe-Taylor, J. We develop a new tool for data-dependent analysis of the exploration-exploitation trade-off in learning under limited feedback. Our tool is based on two main ingredients. The first ingredient is a new concentration inequality that makes it possible to control the concentration of weighted averages of multiple (possibly uncountably many) simultaneously evolving and interdependent martingales. The second ingredient is an application of this inequality to the exploration-exploitation trade-off via importance weighted sampling. 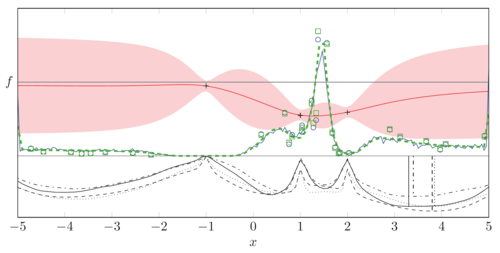 We apply the new tool to the stochastic multiarmed bandit problem, however, the main importance of this paper is the development and understanding of the new tool rather than improvement of existing algorithms for stochastic multiarmed bandits. In the follow-up work we demonstrate that the new tool can improve over state-of-the-art in structurally richer problems, such as stochastic multiarmed bandits with side information (Seldin et al., 2011a). rst decides which of the options to execute and, subsequently, the option-policy determines the action. In this paper, we reformulate learning a hierarchical policy as a latent variable estimation problem and subsequently extend the Relative Entropy Policy Search (REPS) to the latent variable case. We show that our Hierarchical REPS can learn versatile solutions while also showing an increased performance in terms of learning speed and quality of the found policy in comparison to the nonhierarchical approach. Hossain, M., Wehrl, H., Lankes, K., Liu, C., Bezrukov, I., Reischl, G., Pichler, B.